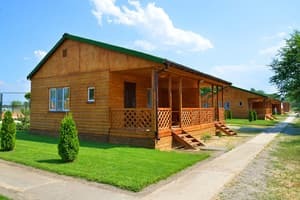 The base of green ecotourism "Slavutich" has 16 rooms with all conveniences in ecologically clean wooden houses with large terraces on the shore of the Kakhovka water reservoir. The rooms are equipped with shower, toilet, washbasin, mini-bar, refrigerator, air conditioning, TV and satellite TV. On the territory there is a cafe with a large tent, a bar, a hunter's house and a fisherman with a fireplace. Sports grounds, tennis, mini football field with artificial turf, volleyball, basketball, table tennis, billiards with professional tables, 18-hole mini golf, gymnastics, and other sports. 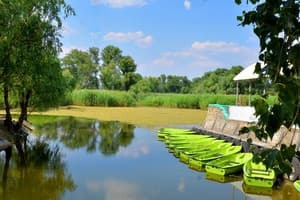 At the base of the green eco-tourism "Slavutich" there are three fountains, a pond with swans, a small muses with a miller's house, old-fashioned utensils and objects of everyday life. There is a place for parking the car. On the territory of the base there is a café with dishes of European cuisine. A number with a base of 60 kilometers is the atmospheric reserve "Askania Nova". 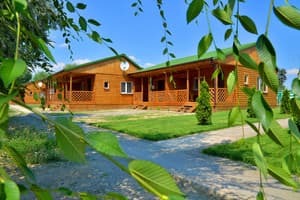 Kakhovka Train Station is 5 km from the hotel and 83 km from Kherson Airport. Description of the room: Wooden houses for living are built with environmentally friendly plank materials on Canadian technology. The rooms are quiet and cozy. 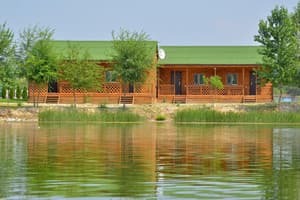 Vidovye terraces for you and your guests with a view of the backwater of the Kakhovka reservoir, where you can hear the pleasant sound of water, and the singing of birds. Description of the room: Double bed, air conditioning, TV with DVD player, mini bar fridge, wardrobe, table, chairs, sideboard, armchairs, electric kettle, tea set, bedside tables, hangers, electric heaters, shower, toilet, washbasin, mirror and t .P. Wooden houses for living are built with environmentally friendly plank materials on Canadian technology. The rooms are quiet and cozy. Species terraces for you and your guests with a view of the backwater of the Kakhovka reservoir, where you can hear the pleasant sound of water and the singing of birds. Description of the room: 50% discount for the newlyweds for accommodation (subject to the wedding celebration at the recreation center cafe). Large terrace in front of the room. 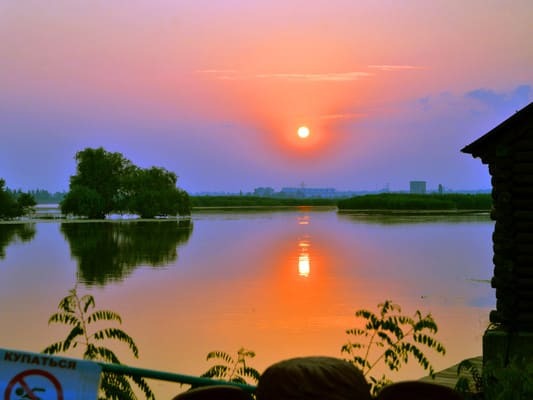 From the room there is a pontoon - a bridge to the Kakhovka water reservoir, a great place for counting the stars and contemplating the sky above the river. Large double bed, TV with DVD player, mini bar fridge, table, chairs, electric kettle, tea set, bedside tables, hangers, electric heaters, shower, toilet, washbasin, mirrors, etc. 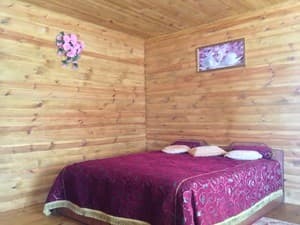 Description of the room: Four beds, air conditioning, TV with DVD player, mini bar fridge, wardrobe, table, chairs, sideboard, armchairs, electric kettle, tea set, bedside tables, hangers, electric heaters, shower, toilet, washbasin, mirrors, etc. . Wooden houses for living are built with environmentally friendly plank materials on Canadian technology. The rooms are quiet and cozy. 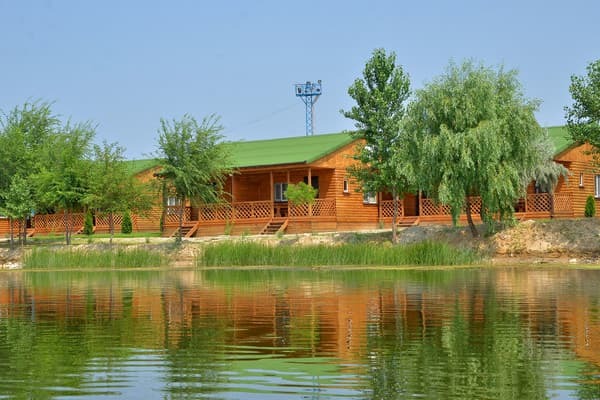 Vidovye terraces for you and your guests with a view of the backwater of the Kakhovka reservoir, where you can hear the pleasant sound of water, and the singing of birds. Description of the room: Double bed + two bunk beds for children, air conditioning, TV with DVD player, mini bar - fridge, wardrobe, table, chairs, sideboard, armchairs, electric kettle, tea set, bedside tables, hangers, electric heaters, shower, toilet , a washbasin, mirrors and the like. Wooden houses for living are built with environmentally friendly plank materials on Canadian technology. The rooms are quiet and cozy. 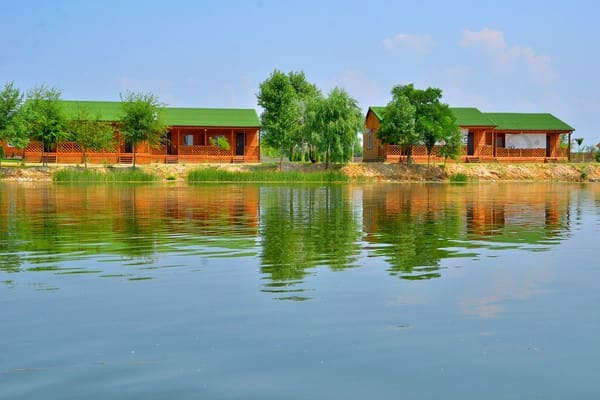 Vidovye terraces for you and your guests with a view of the backwater of the Kakhovka reservoir, where you can hear the pleasant sound of water, and the singing of birds. Спасибо за уют, чистоту и профессионализм персонала! К сожалению, мы попали в период нашествия мух в этой местности. В номере не было средств защиты от них. Домики на берегу, много спортивных площадок на любой вкус, интересный зоопарк. Неудобный душ, в будние не работает меню на мангале. В домике советская мебель, искуственные цветы. Children are accommodated with their parents in the room. There are special rooms for parents with children (bunk beds). Additional places, if desired, are provided on folding beds for an additional fee = 50 UAH. per person. On the territory of the base there is a café with dishes of European cuisine. 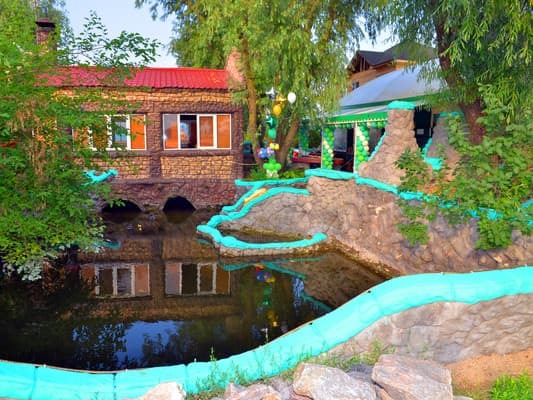 The base of green ecotourism "Slavutich" is located in the Kherson region, the city of Tavriysk, one of the most beautiful places in the south of Ukraine, in the lower reaches of the Kakhovka water reservoir, at the source of the North Crimean Canal and Kakhovka HPP. Near the Base "Slavutich" in 60 kilometers is the atmospheric reserve "Askania Nova", with a large number of flora and fauna. A few kilometers from the "Slavutich", there are countless vineyards, and next to the wine cellars of Count Trubetskoy, as well as the brandy factory "Tavria". Organized tours with wine and brandy tasting on the soft, comfortable 46-seat Mercedes-Bens bus. Sauna with salt room (Himalayan salt), solarium, simulators. Versatile sports activities. 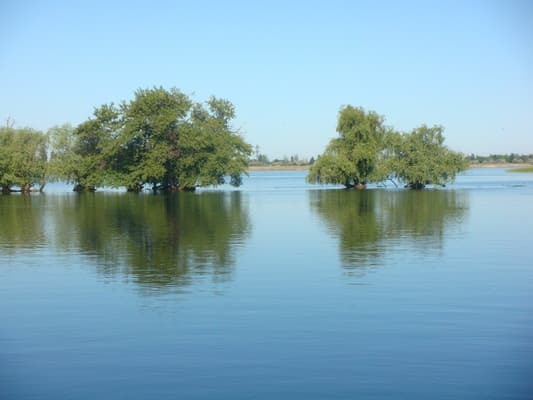 To the base of green ecotourism "Slavutich" it is possible to pass by all types of transport. By car from Kiev 600 km, from the regional center of Kherson 70 km to the city of Tavriysk, by rail from the station Kherson to the station Kakhovka (g Tavriysk) 117 km. From Airports: the city of Kherson - 75 km, the city of Simferopol - 220 km, the city of Nikolaev - 150 km, Dnepropetrovsk - 280 km, Zaporozhye - 290 km. River transport - the river port of Novaya Kakhovka - 10 km.